First of all: after you update the plugin, delete your browser/plugins caches. I’m excited to announce Yasr 1.8.0. Until now, Yasr use to work with a jQuery plugin called rateIt. After a lot of under the hood work, it’s now working thanks a library called rater-js. What’s the difference for the final user? 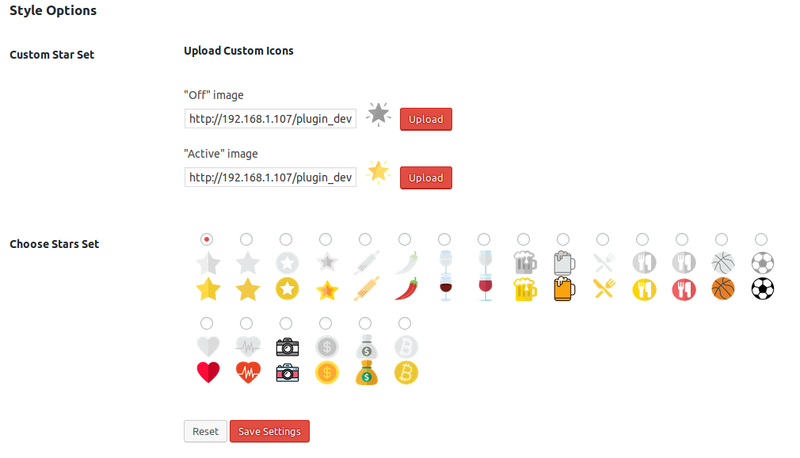 You can now upload your custom icons, without the tutorial! This is a very important release, with a brand new cool feature! From this version, Yasr can support AMP page! Please note that this is a beta. Report any problem in the support forum. You can disable this anytime. The european GDPR law is approaching! Because of this, YASR, from version 1.6.1 doesn’t save anymore the IP Address by default. Yasr 1.6.2 has instead a better cookie managment. Yasr 1.6.0 is finally out. This is an important update for who in the past bought one or more extensions: from today extensions will no longer be developed individually, but they will all be included in a single paid version of YASR, which will be called YASR PRO. This is Dario, the author of Yasr -Yet Another Stars Rating. You are receiving this email because it seems that you have an active license, for one or more extensions. Starting next week the extensions will no longer be developed individually, but they will all be included in a single paid version of YASR, which will be called YASR PRO. How to get the new license? Just write back to this email, indicating your current license. If for some reason, you didn’t get it, just submit a comment here. Yasr 1.5.8 has been just released, with some amazing news! But the exciting news is another one! A long awaited feature is now available: it’s now possible to delete the unwanted votes! To do this, just need to open the “Log” page under the new “Yet Another Stars Rating” menu. This fix the shortcode yasr_most_or_highest_rated_posts shortcode. Released two days ago, Yasr User Reviews 0.1.6 fix the shortcode creator in text mode. As you may already been noticed, Yasr 1.5.2 and then Yasr 1.5.3 are out. This is an important update because reduce a lot the number of the queries in the archives pages. I’m happy to announce that from today Yasr is again an active and maintened Plugin. Both version 1.5.0 and then 1.5.1 have been released. I’ve been away from almost 3 months. I’m sorry for this, but now Yasr is finally coming back! Just today I’ve released a fresh new release, the freemius sdk have been removed. Many other features will be available soon!